Excellent for small line cleaning. Opens clogged lavatory, sink lines, urinals, and tub/shower drains. Quickly opens clogged tub lines. Advance and retrieve cable without reversing motor. 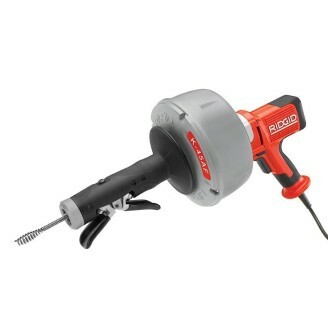 Product comes with C-1IC 25' (7.6m) Inner Core Cable with Bulb Auger. Excellent for small line cleaning. Opens clogged lavatory, sink lines, urinals, and tub/shower drains. Quickly opens clogged tub lines. Advance and retrieve cable without reversing motor. This model is supplied with: C-1IC inner core cable with inner drum, C6 cable with inner drum, T-250 tool set, C-6429 carrying case. 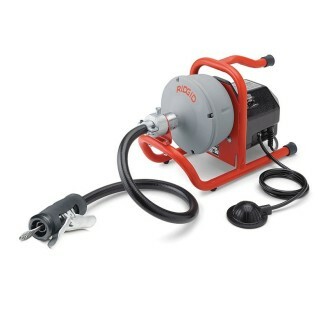 The RIDGID K-40AF Sink Machine Comes with AUTOFEED Guide Hose Mounting Bracket C-13IC-SB, 5/16" x 35' (8mm x 10,7m) Speed bump cable with inner drum. The K-40AF Sink Machine comes with AUTOFEED Guide Hose Mounting Bracket C-13IC-BS, 5/16" x 35' (8mm x 10,7m) Speed bump cable with inner drum. 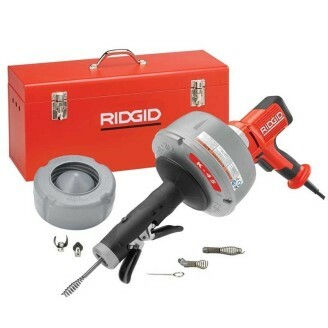 RIDGID Professional's choice for many years, The RIDGID K-25-DH Hand Spinner offers premium quality. It's the ideal tool for user who demands the best. 3/4" yo 1½" (20 to 40mm) Drain Lines. The K-26 Hand Spinner with C1 Bulb Head Cable is ideal for users seeking excellent performance and value. 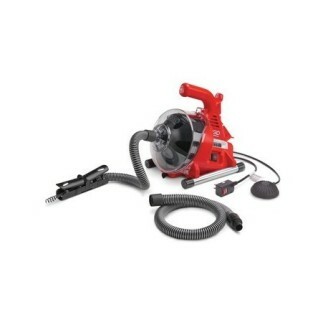 RIDGID powerful, compact and versatile PowerClear drain cleaner effortlessly cleans tub, shower or sink blockages from ¾" (20 mm) to 1½" (40 mm) diameter, cable - 6 mm - 9 m (¼" x 30') Operating temperature -7° to 49C°. Dimensions 5,6cm x 22,9cm x 29,2cm (14" x 9" x 11,5").